It’s my party and I’ll cry eat delicious cupcakes if I want to! Ok, it’s not technically my party, but it is my girlfriend’s birthday tomorrow and we’re have a girl’s get together for lunch. I was ever so politely asked (note: begged) to bring a dessert along and I have had cupcakes on my mind ever since! It feels like forever since I have made cupcakes (which probably means 2 weeks in my world) and I knew I had to do something to remedy this situation. Liz loves cupcakes. I love cupcakes. Other people love cupcakes. It’s a win-win-win. Beat that Team Sheen. Cupcakes, to me, are a triple threat. They are one of my favourite desserts to bake (easy), decorate (fun + easy), and photograph. You really can’t screw up a photograph with a cupcake in it! I present the ever-horrifying chocolate turd cupcake. In all my excitement, I didn’t realize that I had piped perfectly formed turds on my beloved cupcakes until after I uploaded the photos. It was not a proud moment. Eric and I could not stop giggling at them. Seriously. It was bad. 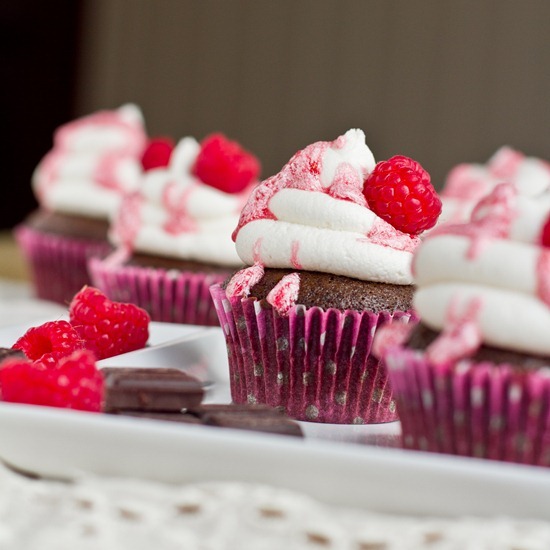 Luckily, I redeemed myself with these delicious Chocolate cupcakes topped with fluffy sweet clouds of frosting and a fruity raspberry glaze. They are a fun cupcake to bring to any Spring or Summer gathering because they are just so light and fluffy with a hint of fruit on top. Gathering or not, you should make them just because you are special. That should be reason enough! 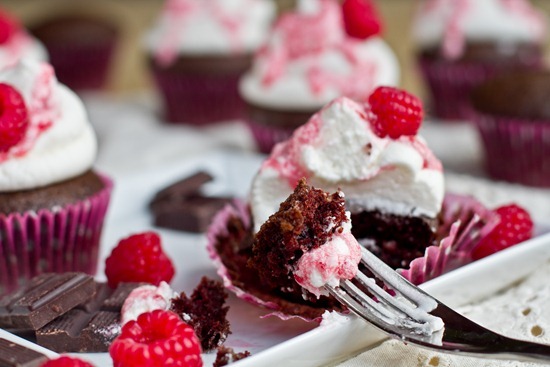 I love cupcakes because the batter can be thrown together in just a few minutes. This recipe doesn’t get any easier too. It is literally- 1) Mix wet, 2) Sift in dry, 3) Mix. 4) Scoop. Adapted from the famous eggless chocolate cake recipe. <—awesome!! 1. Preheat oven to 350F and line a cupcake pan with cupcake liners. With an electric mixer, beat together the following ingredients in a large bowl (non-dairy milk, oil, sugar, apple cider vinegar, vanilla, almond extract). Beat on medium speed for a minute or two. 2. Now sift in the dry ingredients (flour, cocoa powder, baking soda, and salt). Mix well, until the clumps are gone. 3. Spoon the batter into prepared cupcake pan, about two thirds full for each. 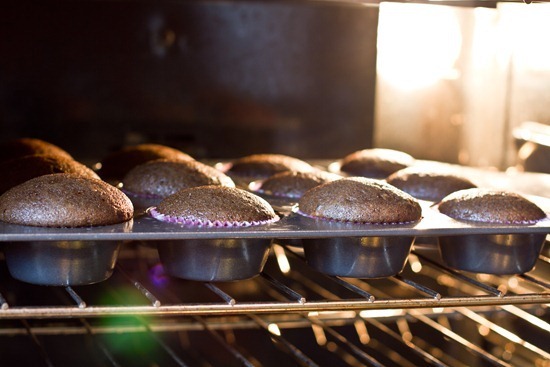 Bake for about 22 minutes at 350F, or until the cupcake slowly springs back when pressed with a finger. Allow to completely cool before frosting. My Aunt got me hooked on this famous eggless chocolate cake recipe years and years ago! I adapted it only slightly. It always seems to turn out no matter how I make it! 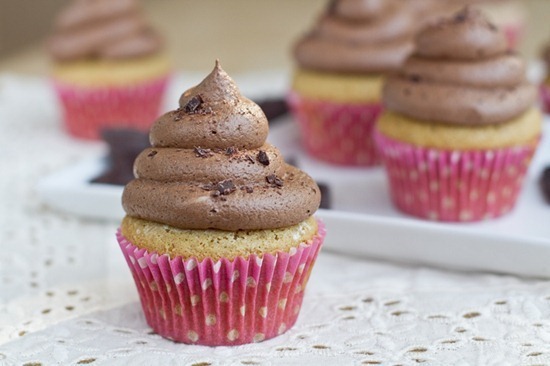 These cupcakes are chocolaty, fluffy, and flavourful with a hint of almond and vanilla. While the cupcakes are cooling, make the frosting. Note: If making the frosting as shown in the pictures, please double the frosting recipe above. 1. In a mixing bowl, beat 1/2 cup of Earth Balance (or equivalent) with an electric mixer. Add in the milk, extract, and salt. Mix. Now gradually add in the sifted icing sugar, starting with 1 cup and mixing slowly until fully combined. 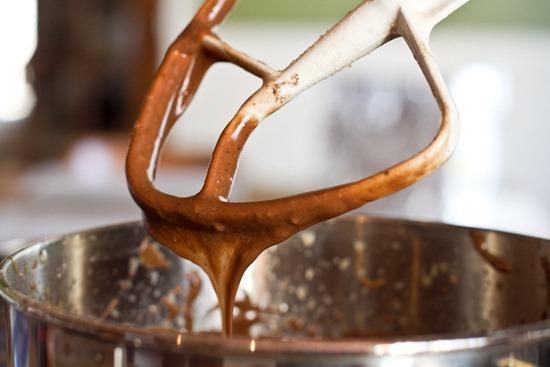 I like to use my stand mixer when making frosting because I leave it mixing for about 5-10 minutes until nice and fluffy. Alternatively you can beat the frosting with a handheld mixer, for at least 4-5 minutes. Reserve about 1/2 cup of the frosting if you want to make the raspberry glaze (shown below). I thought I would show you how I like to pipe my cupcakes! 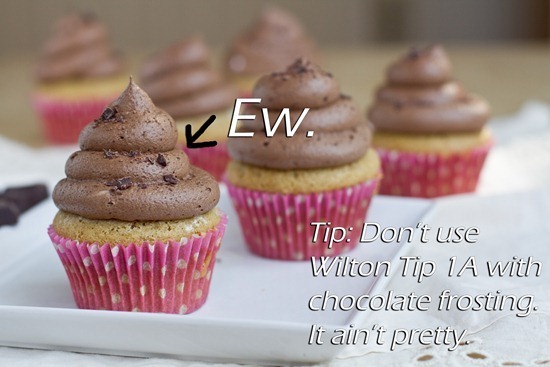 My favourite decorating tip in the entire world is the very large Wilton 1A tip, as shown below. It eats small tips for breakfast. And you don’t need a coupler either! 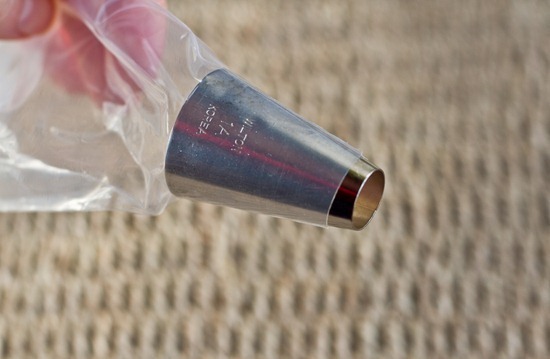 1) To use, simply insert the tip into a pastry bag. Snip off the end of the bag so the tip fits through (as shown above). 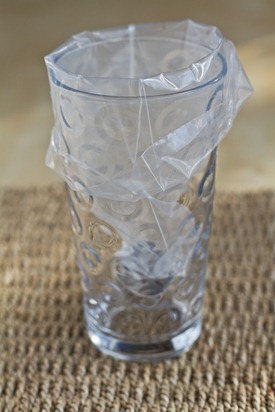 2) Now place the pastry bag into a tall glass to hold it up and fold down the sides around the glass (image left). 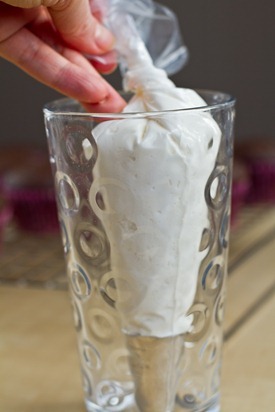 3) Fill the bag with frosting and carefully twist the end of the bag tightly (image right). Secure the end with a rubber band, if desired. Now you are ready to pipe delicious, fluffy mounds of frosting! Don’t be scared, it is easy! You can always do a couple practice trials too and don’t worry they don’t have to look perfect. To pipe, start near the centre of the cupcake, squeezing the frosting out evenly working your way up the cupcake in circles. I like to make 3 tiers for an extravagant effect. This is a great how-to video! You can stop right there or you can top them with a glaze if you are feeling frisky like I was. I saved a bit of the frosting (~1/2 cup) and I made a raspberry glaze. I mashed about 5-6 fresh raspberries with a fork and mixed it with the frosting. The raspberries release a bit of water and the frosting thins out into a lovely glaze that you can drip over the cupcakes. 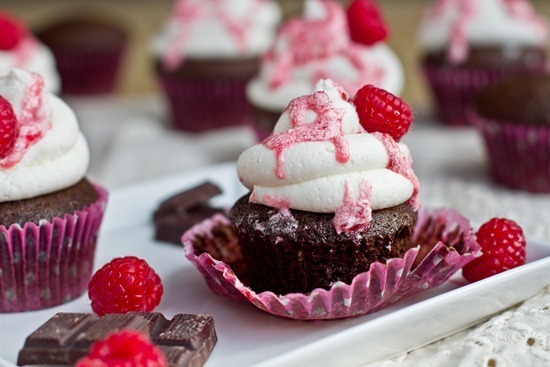 It added a lovely hint of raspberry to the cupcakes that paired well with the chocolate and almond flavours! Of course, I was ‘forced’ to taste-test before giving them to Liz. And I devoured every last crumb! YUM, YUM, and YUM!!! It is 11:30 PM on a school night… I should be in bed, not drooling over your delicious cupcake pictures! The fact that I can’t go downstairs and make these ASAP is pure torture. Well I suppose I COULD but then I’d be forced to pull an all-nighter thanks to all the sugary goodness I’d consume. *deep contemplation occurring* alllllright, i’ll wait till tomorrow. Thanks for the post Angela! 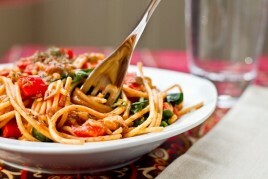 You’re incredible and every recipe never ceases to amaze me and never fails to make me hungry! But those last ones are the most beautiful cupcakes ever! omg these look to die for, I cant believe how amazing and fluffy that frosting looks.. and your photography is absolutely beautiful. i’m more of a muffin and cookie person, but those cupcakes look scrumptious! Sometimes desserts that look scatalogical are better than those that don’t, because the taste is so surprisingly better than you were expecting. I bet your girlfriend will love these! Mmm, those look SOOO good with the berries. Very pretty, too. oh please please please send me one now, had such a long day! I couldn’t help but giggle too when I saw the cupcakes with the chocolate frosting. The ones with the Almond ‘Buttercream’ frosting looks amazing though. I am always amazed by how you can make vegan treats without using egg or dairy. While I’m not vegan, I’m on a gluten-free, egg-free, dairy free diet. Your blog has taught me a lot about making desserts without using eggs or dairy:) Thanks Angela! i should make this for my birthday!!!! They look amazing!!! Just as I’m craving sugahhhh!! Oh my Lord! Those look too good for words. Everything looks amazing! YUM! The raspberry glaze is so pretty! My birthday is May 2nd. I’d even take your turds. Holy amazingness! I wish I could stuff them in my face right now. :P Another recipe I want to try is the one that Chef Chloe used to win Cupcake Wars. It must be good! 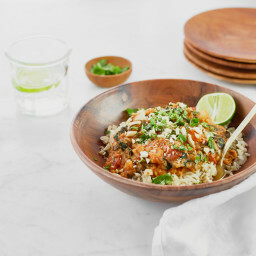 http://www.chefchloe.com/blog/2-blog/17-first-vegan-to-win-on-the-food-network.html It’s super close to yours; the only difference is the amount of oil, vanilla and apple cider vinegar! My gosh, these look so fantastic! I want to jump through my laptop and take a bite. You are a great, great friend. Liz will most certainly be happy with her gift! So pretty! These look very “valentine” appropriate. Love the addition of the almond extract for the frosting. These look so good! The almond extract must give such a great taste to the cupcakes!!! I want dessert, and I want THESE! Wow! Those cupcakes are adorably perfect. I love how these look (even the turdys are purdy). My favorite, though, is step #4 of the cupcake making. That is the best. THAT IS HIGH PRAISE! Ok, these are on the to-make list! The buttercream/almondmilk frosting, oh my. Even if I never make these, my life is more complete for having read this post. And drooled at these photos. Wow Angela, these look AMAZING! I’m going to have to make these at some point! So pretty too. Oh my stars, these are so PERFECT! I want one (or more, hehe!) now. These are some of the most gorgeous cupcakes ever! I can’t believe how perfect the chocolate cupcakes look. They rose perfectly!! I’ve never had that happen with vegan cupcakes. The glaze looks shimmery…sooo pretty!!! Love the poop cakes…I’m sure they tasted delish! Oh yum! I saw your tweet about vegan cupcakes and I thought I was going to have to wait a long time to see the results! I’ve never seen vegan cupcakes rise so high! Gorgeous! Hahahahahaha, I wouldn’t have even went to poop when I saw those brown frosted cakes, but now I can’t help it. This cake recipe is totally getting bookmarked. They look gorgeous! Thank you for sharing the icing tips and video – I’m the world’s worst. YUM i’m dying for cupcakes. i am debating whether or not it is sensible to buy a cupcake pan for just 5 months here in New Zealand….I think, yes? Holy yum! My daughter and I will definitely be making these this week. Thanks for the tutorial on how you frost them. I never thought of putting the bag in a glass. What a great idea! Chocolate turd cupcakes! Hahah! There has to be a good theme party those would be perfect for. You are an awesome friend! Those look so lovely!!! Looking like poo or not I would have still scoffed one! Omgsh omgsh!! That loooks soooooooooo good and pretttyyyy!!!! Hey, i think the poopy one looks just fine! So cute. And heck, i’d eat it too :) But they all look gorgeous. I’ve been itching to make cupcakes too lately, I haven’t baked too much and that’s a big no-no. thank you for your photos of the cupcake turds, angela. sorry, but yes, that is exactly what they look like – and you have started my day with a hearty laugh. thanks very much!! i just *graduated* from taking the decorating basics course thru michael’s last week, so wilton tip #s, couplers, etc are still front and centre in my mind. i agree: cupcakes are awesome to bake, ice, decorate – more fun than a cake! have a great lunch with your friend…will the cupcakes last until dessert time?!! Even if they look like poo, your photos are still amazing! That raspberry glaze is a great idea and adds gorgeous color. 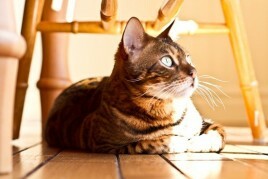 Gorgeous photos- even the turds! What beautiful “turds” ;) Your cupcake photos are amazing!! oh, these cupcakes look perfect! and despite those other ones looking like turds, i’d still eat them in a heartbeat! nothing (i mean, NOTHING) can turn me off from chocolate. bahahahaha the chocolate turd cupcake just made my morning! hilarious :) and i love the tip about putting the piping bag in a glass first…genius! I think you’ve outdone yourself! I can’t wait to try that almond buttercream! These are so pretty! You even manage to make turd-like icing look cute haha! Happy Birthday to your friend – I hope you ladies have a lovely time together! Can the cupcakes be made with out apple cider vinegar? I would have eaten the poo ones too! I think it is necessary as a rising agent. But you won’t taste it. Regular vinegar should work is you do not have apple cider vinegar. There is a King Arthur chocolate cake/cupcake recipe that is vegan which uses regular vinegar. 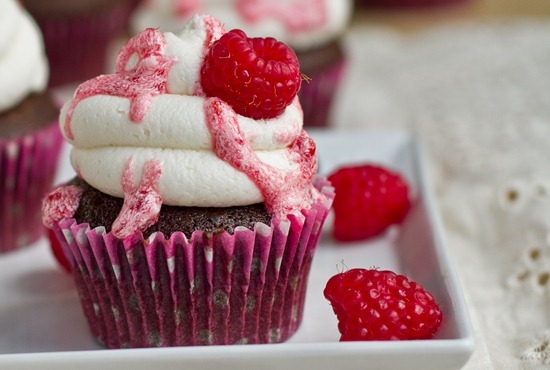 Cupcakes are my go-to vegan recipe, and I bet the raspberries would make an incredible touch! Fruit and chocolate is about as good as it gets! AHAHAAHH if thats poo poo then poo poo sure looks tasty! i am A SUCKER for frosting- anything creamy and sweet- hand it over! It is almost shameful how much am I laughing at the turd cupcake snafu. I’m such an 11 year old sometimes. Anyway, these cupcakes are goregous! They look delicious! Oh my… those look like heaven!! This is soooo pretty! I love it! These look soooo good!! Can’t wait to try them! The EVOO I have is called ‘delicate’ would that be the same thing as extra light? Another photographic masterpiece, where I just want to bite into my computer screen! Must make these! Do you think the oil can be replaced with apple sauce? Ive tried cupcakes with no oil and only applesauce…I found they were always ‘spongy’ in texture. I prefer oil, but you can do whatever you please! These look delicious Angela! And I laughed at the chocolate frosting — some people can make that look good, but I sure can’t! This may be my favorite post of yours EVER!!!!!!!! Gorgeous photography and gorgeous ‘cakes! that’s too funny :) I’d still eat the chocolate ones!! But I do love raspberry + chocolate together. I think even the turd cupcakes are pretty. Your friend is one lucky girl! I wish I had a friend like you! My birthday is on Thursday and no one would bake me vegan cupcakes… Maybe I should make some for myself. Those look DELICIOUS! oh my gosh……………these looks stunning!!!! I’m dying for a cupcake now!! Wow Angela – those look beautiful!! I love that they are so easy—I have all the ingredients in my pantry. Thanks for the early morning giggle (re: turd comments) – they didn’t look gorgeous but I’m sure they tasted awesome. The frosting looks amazing too – I think I’m going to have to put some icing tools on my “to buy” list. Beautiful! Thank you for the chocolate cake recipe; I was looking for a reliable vegan cake recipe and this fits the bill! Will it work with regular cocoa too? I’m definitely going to try making these! Do you think these would still come out okay with a gluten-free all-purpose flour? 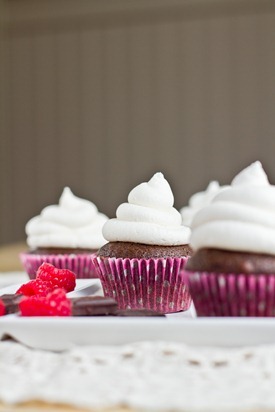 I’m not sure…vegan cupcake recipes can be a bit finicky! YUM! I have been looking for an alternative to a traditional cake recipe for my birthday. Thanks! Do you think it is possible to use oat flour instead of regular flour? It’s been effective in making fluffy muffins, but I am not sure about cupcakes. I find that vegan cupcakes can produce very mixed results when subbing different flours..I really don’t know if it would work! YUM!! I want to eat one of those cupcakes right now!!!! Definitely adding this to my list of “things to bake”. Thanks for sharing!! Your cupcakes and photography are absolutely amazing! Wow, those are pretty! To be honest, the chocolate frosting didn’t strike me as turds until you pointed it out. Haha! Chocolate Turd Cupcakes. Awesome. That is too funny! But this is kind of torturous because I have decided to do a little cleanse and cut sugar out of my diet. But all I want to do is make those cupcakes and eat lots of them! these look gorgeous. you are seriously a master in the kitchen! These are gorgeous, like something you’d see in a magazine! Well except the turd ones…thanks for the AM laugh! i really want to make them, but i dont have apple cide vinger…do u think apple juice would work? I would reheat them in the oven. Maybe placed on a baking sheet and reheated at 325-350, watching closely (the tops can burn easily). Goodluck! I need to make a dessert today for a school fundraiser, and had no clue what to make and ta-da! your blog post appeared! These look perfect! Every little girl is going to want to buy one of these princessey cupcakes — the glaze looks awesome. Thanks for rescuing me! amazing. THese look so great! Amazing post….the poop cakes are hilarious!!!! It was my birthday yesterday so I think I’ll be baking up some of these tonight as a little birthday present for myself!! The photos are absolutely STUNNING!!! WOW. That’s all I can say. These look amazing and the photography is beautiful! I absolutely LOVE cupcake photos. I don’t have a blog, but I take pictures of everything I bake. Tons of cupcake pictures! I just think they’re beautiful. I’ve been debating uploading an album onto facebook just to share them with the world, but I’m pretty sure my friends will think I’m crazy! Anyway, I completely agree, and these cupcakes look delicious. you should…I LOVE looking at pics of cupcakes! Wow, these cupcakes look good. At home I usually watch Cupcakes Wars on the Food Network and I love it when vegan cupcakes win! Right now I am studying in Spain and while the pastries are good, I could definitely use one of these cupcakes! Since I am deprived of the Food Network for a couple of months, I have become an avid food blog follower. I love your food and I can’t wait until I cook some of your recipes at home in a few months! Wow, those are totally – winning! I too have tried one of those oddly shaped cupcake tins before and mine never turned out properly either…I’m not sure what the secret is to them! Glad to hear they were enjoyed regardless though, that is what matters! And it ‘s funny you said that about the poop cupcakes.. I saw the pic and thought to myself “Does she know these look like sh…” and then I read on ;) HILARIOUS! I would scarf down those chocolate cupcakes in a second!! Haha, you are too funny. :-) And those cupcakes look delicious! AND I’m pretty sure, although it does look like poopies, I’d still rabidly consume that chocolate cuppycake. ;) Y-U-M. Right or wrong, I still think those “turd” cupcakes look delicious! It woudn’t even have occurred to me if you hadn’t pointed it out! I love the combination of chocolate, almond, and raspberry. Delicious. OK…color me childish, but even before I started reading and saw the photo of the chocolate, I snickered to myself because they looked like poop. And now I’m going to zip over to cake wrecks and check them out too. Poopy ones and REAL ones, they all look delicous. Gorgeous looking! I recently made cupcakes and understand it is immense work, but the reward is worth it. I am sitting in finance class, drooling on my desk. Thanks Angela! Ahh torture since I just gave up chocolate for lent. Those are the BEST birthday gift a girl could hope for! Wow! These look amazing! I have to say the turd ones I bet were tasty too! lol! I KNOW your girlfriend was the luckiest birthday girl EVER to get these cupcakes! U are a great friend!!! U are a excellent baker! U really need a cookbook ! I cant believe you dont have one yet! I love yours and Mama Peas amazing recipes!!!!!!!!! haha yes the turds were tasty! Not as good as the chocolate ones though! Thanks for your kind words. Hey Tammy! I have not calculated the nutritional info for the cupcakes, but I use this program called Nutrition Data: http://nutritiondata.self.com/ It is decent and works well, but they dont always have all the ingredients. How do you store your cupcakes? I am vegan and have decided to make my own wedding cupcakes (luckily it is a smaller wedding!) and I’m planning to use one of your fabulous recipes. I have to make them a day or two ahead of time (I’ll frost them the day of) but I was wondering if you usually freeze them or just store them on the counter for a few days. Thanks! I love your blog, by the way! these are the prettiest cupcakes ever! not turd like in the slightest! nothing chocolate could ever be likened to pooo! LOL dying at the “turd cupcakes” but they sure do sound delicious!! This is the weirdest coincidence EVER! i’m throwing my sister in law a baby shower this thursday and planned on making chocolate cupcakes with buttercream (except mixing a little bit of rasperry puree into to buttercream and with a rapberry jam filling) with the same piping design! I’m so sick of seeing the 1M tip being used everywhere. AND GET THIS – i even bought the same cupcake tins… crazy i tell you. These look amazing! I love that they are vegan! Oh and I literally LOL’d at your Sheen comment. HA! Angela, I swear your photography is getting better and better with every post! I stared at the first picture for a few minutes lol. What does it say about me that I’d eat that chocolate turd cupcake in a heartbeat?? This is PERFECT! I went vegan for lent and my birthday is this Saturday! Eeek! That means that I need a recipe good enough to please all my family and friends while still being vegan. Angela to the rescue! Thank you! These cupcakes look both adorable and sinful at the same time! I love how you got all “romance novel steamy” at the end describing cutting into the cake. LOL! These look amazing.. you’re just amazing at putting these recipes together!! Thank you for helping all of us eat healthier! You’re changing the world one day at a time! :) Would I be able to whole wheat pastry flour? White doesn’t agree with me :( THANK YOU! Thanks! I’m not sure how a different flour would turn out…my guess would be that they wouldnt rise quite as much. Goodluck! I just made these for my 24th birthday! I made a couple adjustments, but they turned out great! I will be posting some pics soon! Thanks Angela! Oh my gosh, nummmy!! These look delicious, and so pretty, too! I’m thinking about adapting this into a layer cake for my brother’s birthday. I noticed the original recipe calls for 1 teaspoon of vinegar and yours calls for 1 Tablespoon. Was this a typo or did you find that it worked better with more vinegar? nope that is not a typo :) enjoy! This is my new favorite website!! I thought baking would be in the past trying to go vegan, boy was I wrong! I spend hours a day on your website (not kidding) I made these last week for my dad’s birthday and everyone love them. I didn’t tell them they were vegan until after because everyone gets weirded out and won’t try things if they know it’s vegan. My dad ate 2! I made the chocolate cupcakes for my friend’s birthday yesterday along with another vegan vanilla cake. The chocolate was certainly the better of the two. How do you feel about creating a vanilla version of the chocolate cake? If anyone can do it, I know you can! wow, they look so delicious! and the icing… can you send me one? thanks. I am so excited to try this recipe! My son is egg-free, dairy-free, and has a texture aversion to bread like consistencies. The texture aversion is due to the fact that most bread like things have dairy and/or eggs so he doesn’t eat them very often. I am so excited to have found your blog (through a post on pinterest) and start trying your recipes! For the record, my son (who is 4 years old and tries to fit the word poop into every conversation because he knows it annoys me) saw the chocolate cupcakes, and when I asked him he said the frosting looked like ice cream! I told him you thought it looked like poop, and he laughed and said you were funny. I agree. haha too funny! I hope you both enjoy the cupcakes! My son has an egg and dairy allergy, and he loves chocolate, so these look nearly perfect! I’m thinking of making these for his second birthday party. Of course, I still have to contend with my husband’s gluten issues…do you think this would turn out alright with gluten free all purpose flour? Hey Nichole, That is a great question and I’m afraid I don’t know the answer! I will have to try it someday. My only suggestion is to scan through the comments and see if anyone mentioned making them GF. I hope it works out for you!! Mixing with one hand and typing with the other. just dipped my finger in the icing and it is delicious! thank you sooomuch for the recipe! I used coconut oil instead of the buttery sticks and still amazing!! 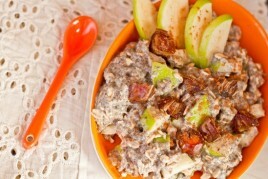 Hi there, I just want to say how lovely this recipe is! It’s one of the easiest, tastiest recipes for cupcakes I’ve tried. I made chocolate frosting instead of almond, and it was spectacular. Wow. These cupcakes are certainly the business. I realized that I actually knew how to make the batter from my childhood. We called it ‘Wacky Cake’ because it used vinegar. But I am SO GLAD I found it again! I’m always trying to entice people with yummy vegan treats, but no one ever believes how delicious they can be! Even my carnivorous brothers are begging me to makes these again. They were gone with 24 hours! My mother hates raspberries with chocolate, so I did 6 with the raspberry glaze, and then 6 with just dusted cocoa powder on top. She loved them! She even ate a raspberry one ;) Seriously, thank you so so much for sharing this amazing recipe! The best Vegan Chocolate cupcakes I have EVER tried. I’m a professional pastry chef and this recipe is in close competition with my favorite non-vegan chocolate cake recipe! Sooo delicious! I love these cupcakes! They are by far my favorite vegan cupcake recipe. However, I am wondering if I can somehow adapt this recipe to make red velvet vegan cupcakes? Would I just use the same ingredients for everything but add red food coloring? These look awesome! I was wondering how they compare to the chocolate cupcakes from Vegan Cupcakes Take Over the World (if you’ve made those)? The ingredients are just slightly different, but these look like they rise better. Hey Lumy, Any dairy-free butter replacer should work! Deliciously moist cupcakes! I made a few changes ( being in Costa Rica I don’t always have the same ingredient options) I used Yuca flour. I also used a surprise cupcake pan which has a metal pin in the center of each cupcake tray to place a small chocolate bar or strawberry. Superb!! Thank you for all your amazing recipes that I am enjoying sharing with all my friends and family! Made these cupcakes several times now and I get RAVE reviews when I do! The chocolate is a look delicious and by far the best cupcake I have ever had. Everyone who takes a bite tries to figure out the secret to the frosting (almond extract). They know there is a little something making it special, but they are not sure what it is. Overall an outstanding recipe!! Thank you for another great one. Hi Angela! I made these cupcakes last year for my daughter’s birthday, and will be making them again. They were a huge hit! This time, I’d like to make half chocolate and half vanilla. Have you tried a vanilla version of this recipe? How would the recipe change? Thanks so much! Glad to hear that Christina! Angela, these look incredible, and I have all the ingredients in the cupboard! One question, though: why is there so much sugar? 6 cups for the frosting, that’s two whole bags of sugar! I had to resort to the non doubled three. Is there any way I could cut down on sugar, and replace it with agave or something? Also, 1 tablespoon of vanilla is also a lot for a cupcake, can I cut that down? Hi there, You could definitely get away with cutting down the sugar – probably in half for the cupcakes (1/2 cup instead of 1 cup would be the lowest I’d go). I haven’t tried a liquid sweetener yet, but if you do please let me know how it goes! We just finished eating these- without icing they just might be the best chocolate cupcakes I’ve ever tasted!! Vegan or not!!! Next time I’ll try icing them, but they don’t need it. Thank you for the amazing recipe!!! These cupcakes look amazing! I’m so happy I found them for my sons bday party next week. I was wondering if you have made them without sugar? Or would i be able to substitute in maple syrup or honey (the two sweeteners I use)? Thanks Angela! Love your website. Hi Mandy, I haven’t tried it yet, but someone in the comments might have? I would give them a look through. Please let me know how it turns out if you do try it. I’ll have to attempt it when my cookbook testing is done. All my best! I made these with Trader Joes gluten and wheat free flour mix and made icing with powdered sugar,cocoa and almond milk. Out of this world! hi! thank you so much for this recipe! every year for my boyfriend’s birthday i make him his favorite–chocolate cake with chocolate frosting. he’s a classic kind of guy :) i have been trying to find a healthier-but-still-yummy chocolate cake recipe, and this one looks very promising! i am about to embark on making it with the two-ingredient chocolate frosting you posted a few of days ago. one question, would this batter recipe work for a two-tier 9″ cake? thank you! So, I have a co-worker who is vegan and pregnant. Since I am an intern and leaving, a few of us decided to throw her a baby shower on our last day. I am known for my chocolate chip cookies and other baked goods, but they are not vegan nor am I. I went in search of a recipe that wouldn’t be too difficult and purchased the ingredients to make these cupcakes. THEY were a hit! Not only with her but the non vegan / vegetarian folks as well! I have promised to make these over and over and not tell anyone they are vegan until AFTER they have eaten them…people just seem suspicious when you say you made something without the animal products. Thank you for posting this recipe! Holy cow! These are deeelicious! Maybe the best chocolate cupcake I’ve ever eaten. My four year old and I just made these. We didn’t have everything for the almond butter cream, so we improvised with the fudge frosting made with dark choc. chunks and coconut milk. Woo hoo! Thank you for sharing! is there a recipe for the chocolate frosting? looks delicious! I just added sifted cocoa powder to the frosting recipe. It turned out great! Making these right now! Some are kinda small. My daughter couldn’t wait. She loves the batter so much!! They already smell so good! Can’t wait!! Hi Angela! I’m having a bake sale soon to raise money and I’m going all out vegan this year! I’m in love with these cupcakes already! I was just wondering, what would happen if I replaced almond milk with coconut milk? I had some on my hands that I want to get rid of. Thanks! Im sure that would work just fine! Trying these out this weekend- but, would they turn out okay if I made them gluten free with oat flour? I’m trusting your expert opinion! Hey Anne, In my experience, oat flour needs a binder – since it doesn’t have gluten I don’t think it would work alone in these cupcakes. Unfortunately I haven’t played around with a GF recipe yet. If you try anything let me know how it goes! did you ever try this with the gluten free flour? Hi again! I just prepared some cupcakes and made the frosting. It’s the night before the bake sale and there’s one huge problem. The cupcakes are a little bland and the frosting is REALLY REALLY REALLY sweet! I doubled the frosting recipe and added 5 cups of powdered sugar before I taste tested it and the frosting was WAY too sweet. I added some salt to help cut the sweetness and now it’s too sweet and a little salty…..Help please? Thank you so much for sharing this recipe :) I made these this past weekend for my daughter’s 5th birthday party, and they were a hit! Both parents and kids loved ’em! Living in Austin, Tx, I can assure you that the buttercream icing will stand true even in 95 degree heat with absolutely no melting. (Seriously, what icing does that?!) It’s a recipe I am going to keep on hand for sure! I made these this morning! YUMMY! I used a mini muffin pan so the recipe made 36 little cupcakes (only 49 calories each) – bake for about 11-12 minutes. The almond frosting didn’t come out so well because I made the icing sugar (regular organic cane sugar run through my Vitamix), but it still tasted good. I’m new to the plant-based lifestyle so this was a real treat! Thanks! Is unbleached all-purpose flour really healthy for vegans? I’m new to the vegan world so I need all the food recipes I can get. Right now I’m doing a reboot by juice fasting; an idea I got from watching Fat, Sick and Nearly Dead by Joe Cross on Netflix. So far, I’m in day four. Anyhoo, please let me know so that, once I’m done with the fast and start my vegan lifestyle, I won’t get bored in the dessert department. THIS IS AMAZING. the frosting is better than any non-vegan frosting ive ever had, too. I just made these for a “vegan cook-off” event at my office – I used a different frosting recipe, but the cupcakes themselves are AMAZING. So yummy and moist. I must admit though, I couldn’t stomach licking the bowl. It just tasted like chocolate olive oil, but the finished product was/is delightful! Thank you for sharing! Do you store in the fridge or on the counter? With frosting and glaze? Also, would you substitute anything in for the almond extract if making for someone with nut allergies? I made the cupcakes and frosting for my daughter to take to school for her birthday and they were a big hit with the kids. I then made a double batch of batter and made into a layer cake for my daughters birthday. Everything turned out wonderful. Thanks for the recipe!! Hi there! How long and at what temp did you bake layer cake? Thanks gor any tips!! Tips on how to alter this to make a cake-cake, instead of cupcakes? I want to not burn it or otherwise mess it up for my birthday this weekend! Can these be made gluten free? They look amazing! Great job! Delicious but mine stuck to the paper liners… Do you know what may have happened? I love baking cupcakes. My friends and family are probably sick of them. Some people have been trying to get me to bake vegan versions. Oh hell no I said! Dessert is meant to be sinful not healthy. Besides theyll be disgusting. WELL. Boy was I wrong. 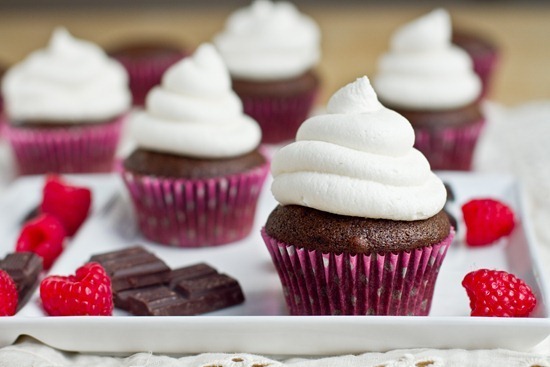 Just made these today because its 10 below zero outside And a perfect day to bake cupcakes. SO IMPRESSEDwith how good these turned out! Hello! Could we substitute the buttery stick with coconut oil? I think it would add an AMAZEBALLS flavor, and is a type of substitute? Could it work? Lovely post many thanks!! 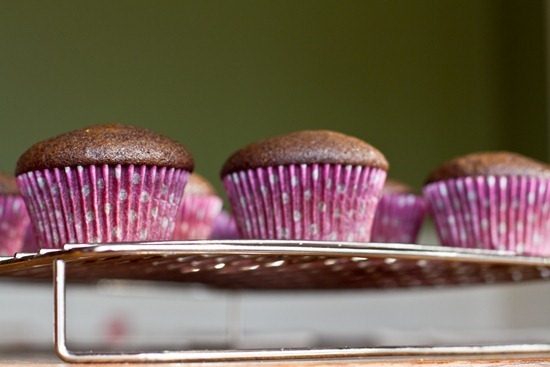 Angela – I have made these cupcakes of yours several times and they are moist and delish! Do I have to have Earth balance Sticks though – or what happens if I use EB out of the tub? We don’t have a store in town that carries EB besides in the tubs. I think it should still work ok! Let me know if you try it out. I can’t wait to make these for my sister’s baby shower this weekend! My only hurdle is that she isn’t a huge fan of chocolate. I was thinking of trying half a batch of vanilla for her. Could I leave out the cocoa and maybe up the vanilla extract to accomplish this? Thanks so much! Can’t wait for the cookbook! Hi Jamie, I’ve tried doing the same thing – leaving out the cocoa but it was a big flop! The cocoa powder is needed in this recipe because it reacts with the vinegar and baking soda to create a fluffy cupcake. I was hoping to make these for Valentine’s Day. I live in Denmark,where we don’t have anything like Earth Balance,nor do we have vegan “butter” sticks. We have a type of margarine that comes in a tub,would that work for the buttercream? Or should I use coconut oil? Thanks! I may have missed it, but is there nutritional facts to this vegan chocolate cupcakes + chocolate icing recipe? I made these for my Halloween party this year and they are AMAZING! Great color, texture, and taste! Topped them with peanut butter icing, yum! Thank you for such a wonderful recipe! I’m just wondering if cashew cream would work instead of the buttercream frosting? I just made these for Thanksgiving today because my daughter is allergic to eggs. AMAZING!!!! Thank you so much for posting this!!! I made a batch last night and a batch this morning in case last night’s dried out but oh my goodness, I could’ve made them all last night…you can’t tell the difference between the two batches!! Sooo moist!! They certainly were yummy, however your icing recipe doesn’t make fluffily icing like you’ve pictured. I am generally pretty good at baking and tried three times to make icing. I don’t understand how that recipe yields icing of that texture. Is that the recipe you used for your photo? Does the apple cider vinegar in this affect the taste or general formation of the cupcakes? I have a friend who is allergic to fruit and I am unsure if she can have apple cider vinegar. I would like to make the recipe and just leave it out. 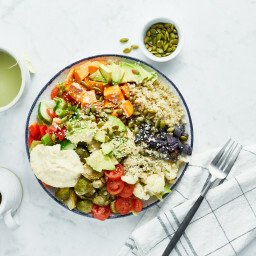 Who knew something healthy could look this delicious? I can’t wait to try this recipe and use a dollop of yogurt on top rather than frosting. Wanted to let you know I used your almond ‘buttercream’ recipe making a cake for a friend who is dairy free, and it turned out wonderfully. Made it “cookies & cream” frosting by mashing up five oreos, then mixing it in once the frosting had set up a bit. I’m using it to ice a chocolate mayonnaise cake tomorrow, can’t wait to try it all together! These are by far the most delicious cupcakes I’ve ever made (vegan or otherwise) and possibly the most delicious cupcakes I’ve ever eaten. However, I didn’t care for the salt in the frosting. I re-made the frosting a second time without the salt and it was OMG bliss. I’m not the best of cooks but my fam said these taste like proper cafe quality goodies! This recipe is seriously better than the cupcake recipes I used to use when I wasn’t vegan! Thanks so much! These are amazing! Yum yum! As I was making these cupcakes, I desperately wished I had some berries (raspberries, strawberries, blueberries, anyberries!) around to put on top just like your beauties above. Alas, nothing. Instead, I used some crumbled up Oreos (do anybody else’s kids smash the Oreos in the box?) and beat them into the frosting. I also put a chunk of Oreo on top after the cupcakes were frosted. Voila! Deeeeeelicious! Thank you for your inspiration! Hi! I’m new! :D I love this recipe it’s awesome, but I wanted to ask you something. My boyfriends sister is celiac and seven, she saw these cupcakes and wanted one so bad so I promised I would make her some, what can I use to replace the flour? Wondering if it would be okay to use almond butter for the frosting because I’m not sure if I can get other vegan butter where I live, planning on making some tomorrow for a vegan friendly stall at my school Aware Day for Peta and Oxfam. Can I make a regular cake with this recipe? I made the cupcakes for my daughters birthday and they were the best cupcakes I’ve ever had in my life! However, my son wants a “normal” cake for his birthday. I did a chocolate layered cake in the Oh She Glows cookbook that is based off of this recipe. Check it out if you are interested. I used the dough of this recipe, combined it with the coconut whipped cream, and filled them with some strawberries – everybody loved it, even non-vegans. also it was the first time i ever tried to fill cupcakes and the consistency of these is just perfect, not too crumbly and not too moist. now i’m going to make them again for another occassion, but the same people will be there so I want to use the components a little bit differently. i was thinking about making a “blond” base, top it with the whipped coconut creme and fill it with mango and passion fruit. but because i don’t have a lot of experience with vegan baking (mostly doing normal stuff) i’m not sure if it is safe to just leave out the cocoa powder, consistency-wise? should i replace it with something (ground almonds, nuts…?) or reduce the amount of liquid? 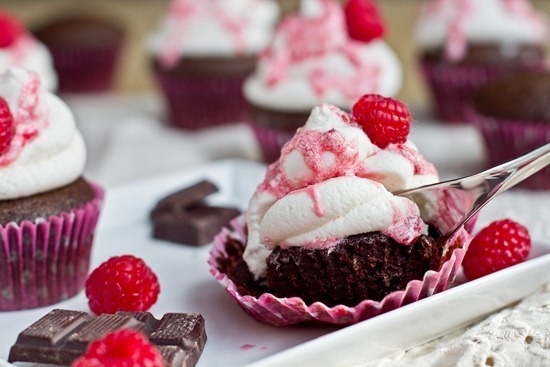 Fabulous cupcakes – will be my go to recipe from now on when a craving for chocolate cake hits! I like to top my chocolate with whipped coconut milk to provide a nice contrast without the sugar or extra sweetness. Can I use regular white vinegar ? 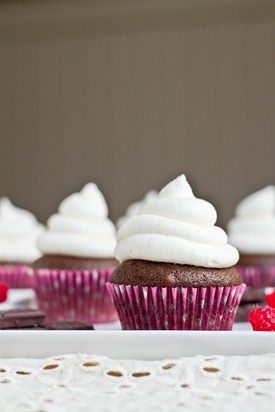 Thank you for this amazing cupcake recipe- this is the only one I use for chocolate cupcakes! Vegan and non vegan approved & loved! I just made these – they are amazing! I can’t wait to bring them to the potluck today. Is it possible to make this without an electric mixer or will my hand fall off if I try? I just made a batch of these for my lactose-intolerant daughter’s birthday – they are SO delicious and were a big hit with her friends and the whole family! I made a couple of small changes : I used balsamic instead of cider vinegar (after seeing a comment on the all recipes website about chocolate and balsamic), and I think it works well :-) I also threw in a half cup of small choc chips. Then I halved the amount of icing ingredients, added a bit of orange zest and instead of the milk and almond ext. I squeezed a tsp or two of fresh orange juice into the bowl. Wonderful recipe, I’ll be making these again and again, thanks so much ! I used this recipe for mini cupcakes for my son’s 2nd birthday party. I used different frosting, but the cupcakes were perfect and really easy and quick to make. Are those measurements for the frosting correct? I tried making it and it was waaay too powdery and ended up looking up another recipe which had slightly more butter (subtitute) and milk (soy) which really helped. Also followed the cupcake recipe which was absolutely amazing! I’m not yet finished making this yet but I have just made the frosting. While mixing the frosting, it was INCREDIBLY dry and powdery until the last 15 seconds of mixing. I found that I just had to stick with it until the icing sugar gets fully incorporated into the wet mixture. This way you end up with a lovely, thick, buttercream icing. These are officially my “go-to” cupcakes for every event!! Thank you SO much! Everyone loves them, they just taste devine!! I used coco-quench for the milk it’s an Australian organic coconut milk mixed with a little rice milk and water but tastes really good and not as thick as regular coconut milk. I use coconut oil in place of the other oil it does solidify slightly when mixing so I put the mixer up quite high after I’ve added in the dry ingredients. And I use Rapadura sugar for the sugar as its gives them this rich delicious taste. Wonderful and nut free so safe for my daughters kindy cupcake day too. Do you think I could sub spelt flour and melt coconut oil? I used Wholemeal spelt flour as a healthier alternative and they still turned out delicious!! Is there any way to make these gluten free?? Hi Emily! I just made these with Bob’s Red Mill Gluten Free 1 to 1 All Purpose Flour. The recipe made 12 nicely raised, dense, moist chocolatey cupcakes. See my comment dated November 21, 2016. I made these once before and I can attest to their deliciousness however i made two batches this past weekend and I could not get the icing to stiffen. I made this almond buttercream and a peanut butter buttercream I also came across (basically the same recipe but with peanut butter added). I thought my kitchen was just too hot so I tried to cool the icing down, add more sugar, use less almond milk, etc and still I did not get an icing that would keep shape after being piped. Flavor is still great but I have to keep them in the fridge or my cupcakes will look more like cinnamon rolls. Any thoughts to where I went wrong? I made these cupcakes for a birthday party yesterday with Gluten Free Bob’s Red Mill all purpose flour. 1 to 1 replacement. This recipe made 12 nicely raised, moist, dense cupcakes that held together, with a rich chocolately flavor. I used Silk Vanilla Almond Creamer for the liquid. My Vegan family member thought they were the best she had ever eaten! I topped them with your 2-ingredient Chocolate Fudge Frosting. Oh my goodness! This frosting is amazing & I do not like or eat coconut! It was a deep rich, not too sweet fudge surprise! Definitely both recipes are keepers! Thank You so much for sharing! Glad they were a hit! :) Chocolate on chocolate…what a decadent (and such a delish!) combination! Hello! If I use Earth Balance buttery stick for a buttercream frosting, can I leave the leftover frosted cupcakes in a container on the counter (room temperature)? What is your experience with the shelf life of the frosting if you don’t refrigerate it? Thanks! Hey Kolyssa, I don’t generally recommend letting them sit on the counter as the frosting will soften quite a bit. If you can leave them in the fridge that’s probably the best option. Hope this helps! But now I have been asked if I can make vegan and gf chocolate cupcakes !!!!! I can’t possibly use any other recipe than this one, what can I do, can this be adapted to gf? Never mind. I answered my own question. Don’t do it! I only quickly scanned the comments so sorry if this has been mentioned, but did you know that this recipe was featured in a scene on the 2013 movie What If (aka The F Word)? It was posted on the fridge next to a more relevant storyline item. I haven’t tried it yet, but seeing it made me want to search for it online and I surprisingly found it! No way…I had no idea! Now I need to watch the movie. :) Thanks for letting me know, Kris! I hope you love the cupcakes if you try them.